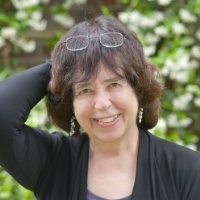 Jane Yolen, often called “the Hans Christian Andersen of America,” is the author of almost three hundred books, including Owl Moon, The Devil’s Arithmetic, and How Do Dinosaurs Say Goodnight? The books range from rhymed picture books and baby board books, through middle grade fiction, poetry collections, nonfiction, and up to novels and story collections for young adults and adults. Her books and stories have won an assortment of awards—two Nebulas, a World Fantasy Award, a Caldecott, the Golden Kite Award, three Mythopoeic awards, two Christopher Medals, a nomination for the National Book Award, and the Jewish Book Award, among others. She is also the winner (for body of work) of the Kerlan Award and the Catholic Library’s Regina Medal. Six colleges and universities have given her honorary doctorates. Read a lot, breathe in the world, attend to things and people around you, listen to the still voice within, then. . .
Work at something every day. While you are working, the Muse will find you, the Grammar Witch will find you, the Time Fairy will find you. But only if you are at your desk. At work.